HomeAccessories & JewleryNecklace vs Neckline – What goes with what? More often than not, it happens – you find a fabulous new top that you cannot wait to show off. Minutes later your excitement turns to frustration and confusion as several attempts later, somehow every piece of jewelry you try just doesn’t seem quite…right. Is it possible? Yes it is. Because just like some shoes go better with certain hemlines, the style, size and shape of your necklace works best with certain necklines. 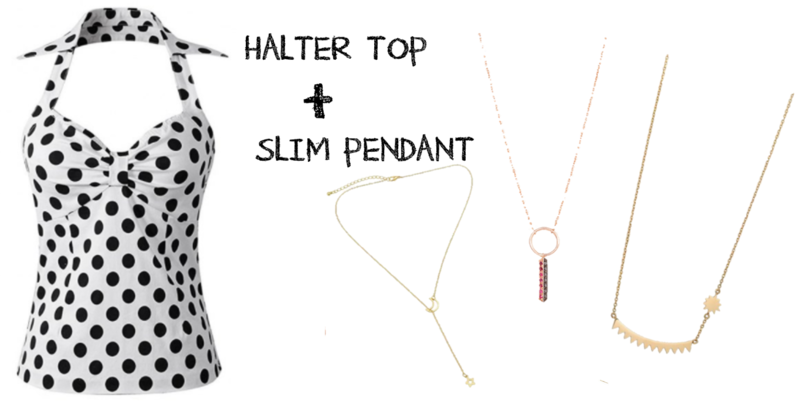 Asymmetrical – This bold neckline goes best with an equally bold necklace. A statement piece works perfectly. Boat Neck – The higher neckline of the Boat Neck allows for showing off your lovely longer strands. Collared Shirt – The collared shirt naturally draws the eye up towards the neck area which makes it the perfect canvas for your more delicate pieces that otherwise could go unnoticed. Crew Neck – Some say this neckline is plain, but we say just add some spicy statement pieces that draw attention front and center. Halter Top – This neckline was made for a beautiful necklace. The tricky part with this gal is getting the length correct. Depending on how far down your open top goes, that will determine how low you can go with your pendant. Scoop Top – The scoop is the LBD of the tops world. 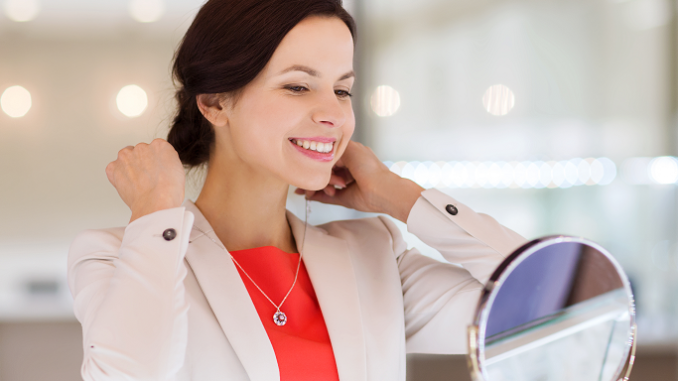 Dress it up or down, it can take just about any type of necklace and make it look like it belongs there. While this chameleon ability lends it to many types, the shorter pendant fits this Goldie Locks top to a T.
Square Neck Collar – They say opposites attract, and in the case of the square neckline this is definitely true. With such a defined symmetrical cut across the bodice, you need something equally strong and opposite in shape. An angular statement pendant does the trick. Strapless Top – With zero material to compete with your lovely decolletage, this neckline gives you the perfect opportunity to show off all those amazing choker necklaces that are so on point right now. SweetHeart Neckline – Take the openness of your strapless top and add some demure sleeves and you have a sweetheart neck. The slightly curved top and sugary name can sometimes throw your judgement into thinking you can only get away with delicate pieces. We’re here to say that just like leather & lace look amazing together, so does this neckline and a bold statement necklace. The trick to remember is length. Mid-length (16″ to 18″) is perfect. Turtleneck – If you’ve got a long pendant you’ve been dying to show off but can’t seem to find a neckline that goes low enough (without compromising anything, that is) you need to look up…neck-wise that is. The turtleneck neckline can handle your lowest swinging pendant as well as that tricky super-busy-but-oh-so-desired multi-chain material piece. V Neck Top – Like the Halter top, your choice of necklace will be very dependent on how far down the drop of your V goes. Best rule of thumb here is to make sure you have at least an inch between the southern most point of your necklace and the end of the V in your V Neck. Last but not least, your necklace should echo the angular shape of the V Neck, so rounded and/or symmetrical pieces won’t look quite right.